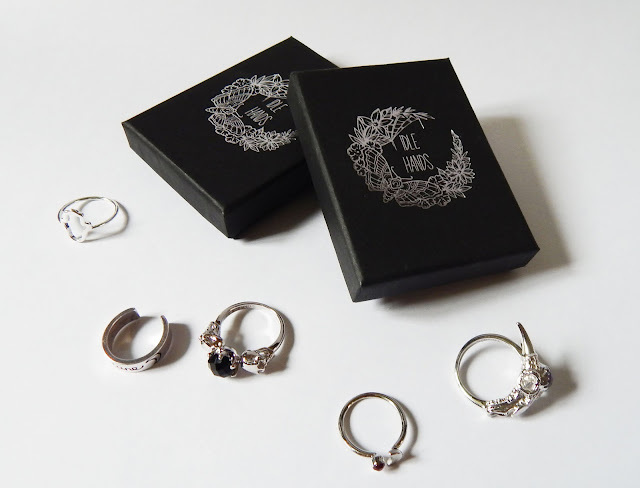 Idle Hands are a relatively new UK based online jewellery shop specialising in a variety of sterling silver and gemstone jewellery and accessories. They stock all kinds of jewellery from one off pieces to necklaces, to midi and normal rings, to bracelets and sometimes headpieces! I was sent 5 of their newest rings to celebrate them hitting 30 thousand followers on their Instagram page! Which you can visit here. 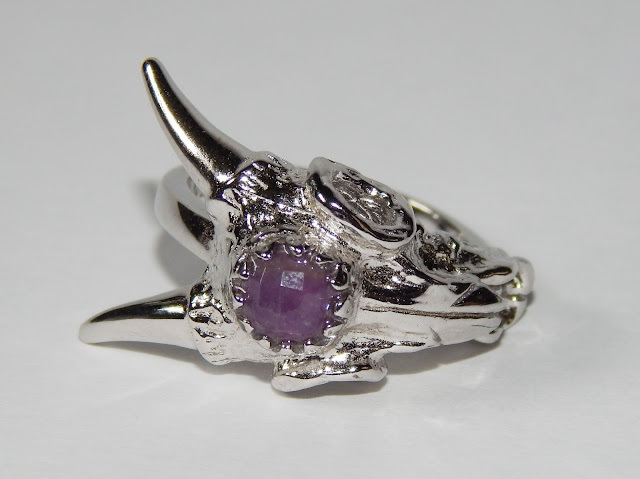 The first amazing ring I was sent is this Sterling Silver Amethyst Ram Skull Ring. It comes in sizes S/M and M/L and is made completely from sterling silver so it won't make your skin go green or anything if you have metal allergies like I do. 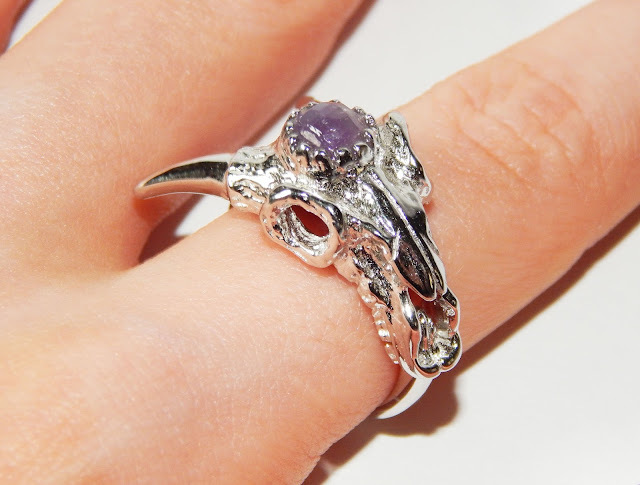 It has a relatively large amethyst gemstone in the middle of the skull which gives the ring a more of a girly look so the skull isn't as harsh as it could be. Amethyst is the birthstone for anyone born in February (me!) and is also traditionally worn to guard against poison. This ring costs £32 and also comes with a black onyx gemstone too. See the ring here. 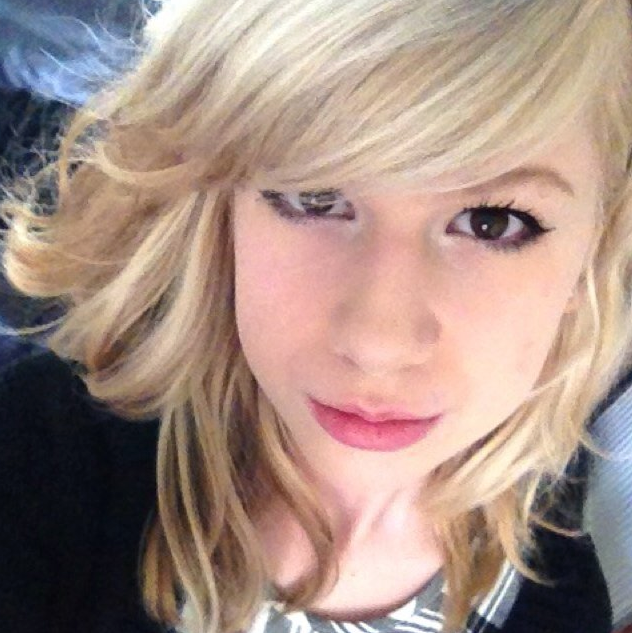 The next is equally as pretty as the one above. 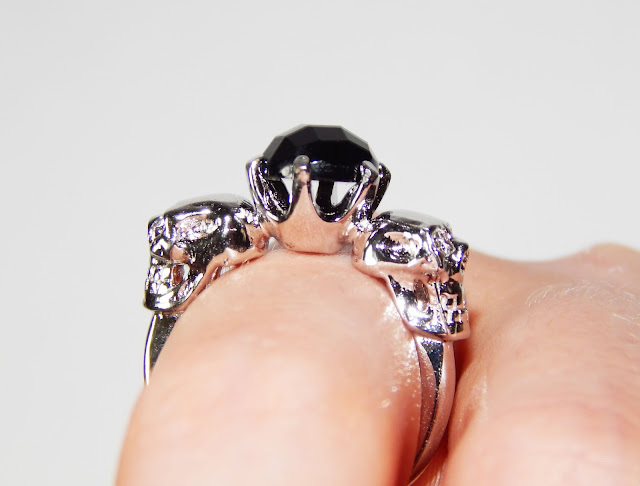 This Sterling Silver 'Death Becomes Her' Black Onyx Skull Ring. 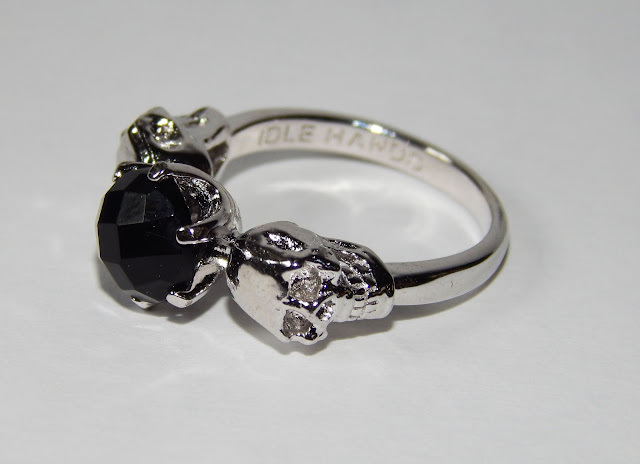 The ring has a large black onyx gemstone set between two silver skulls. This is a really interesting ring and can easily be worn with multiple rings and with many outfits. It also comes in sizes S/M and M/L for £35. This ring is also available in labrodite, which is a greeny yellow shade, amazonite which is a green shade and amethyst and is completely made from Sterling Silver too. See it here. 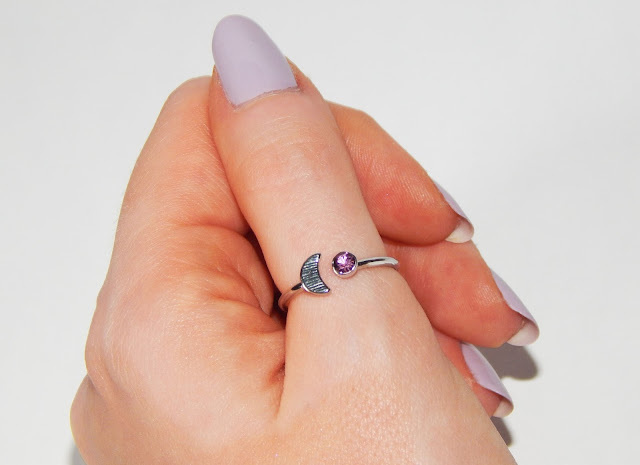 Next, I got this super pretty and delicate Purple Garnet Moon Ring. This piece is currently pre-order on the website and will be sent out as soon as they get some in stock. It is fully adjustable so will fit anyone and is silver plated. This plated ring will mean that the ring won't give you any allergies, but over time with continuous wear, it might make your fingers slightly green! This gorgeous ring is only £3.50! Whats not to like? See it here. Next is this pretty Hamsa Outline Ring. 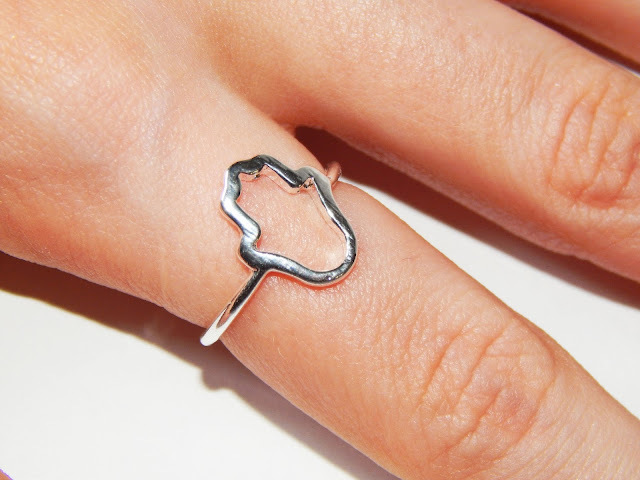 I love hamsa hands so this ring is perfect for me! It comes in one size which is a medium which fits my fingers fine. I have quite slim fingers so on a larger pair of hands, it could easily be worn as a midi ring. This ring is also silver plated, so as above, after continued use, it may cause you fingers to go a bit green, but it will be fine for a relatively long amount of time, so its really nothing to worry about! This ring is £3.50 and can be seen here. 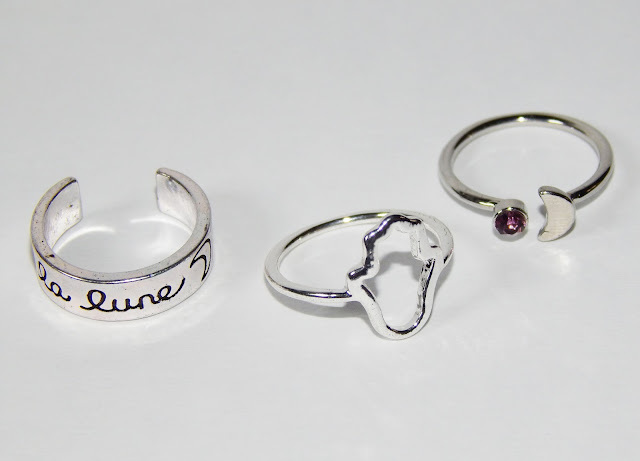 And last but not least, is this La Lune midi ring. 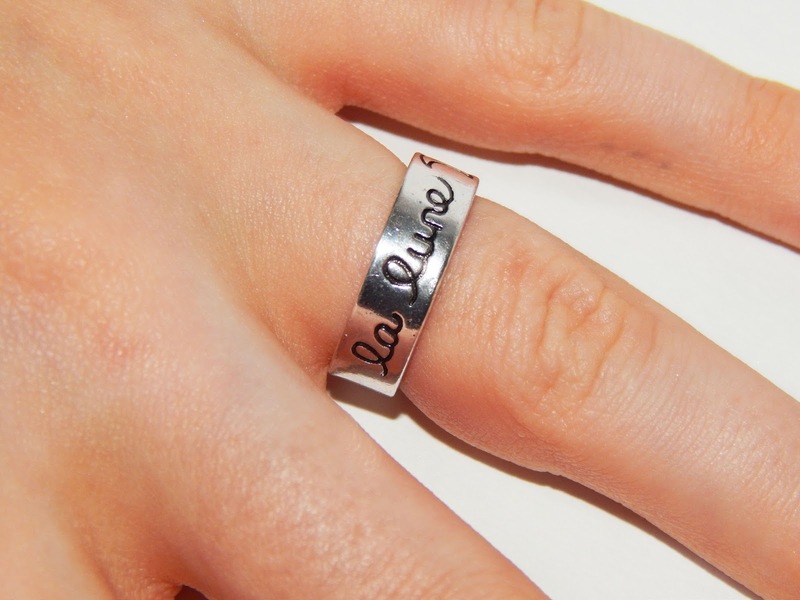 It is silver plated and has the words "la lune" and a little moon engraved into it. 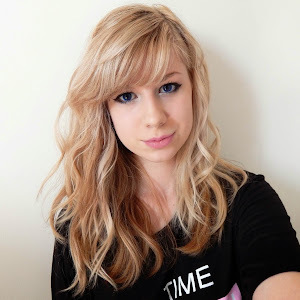 Its really pretty and I have seen this online all over so they are very in at the moment! On me, its not a midi ring size, however as said before, I do have slim fingers. So really, this could be worn either as a midi or a normal ring. Its only £5 and you can see it here. All the jewellery on this site is amazingly pretty and are also so well made. 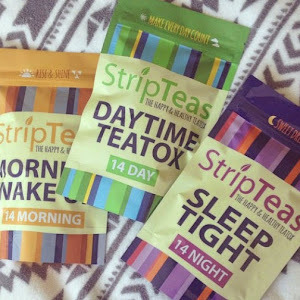 They delivery world wide and accept returns if you aren't happy with your product. Some pieces on their site is often one off or of limited quantity, so my advise would be if you like it, get it, as it may not be there fore long! Your jewellery posts are always so detailed! Do more please!! I also am allergic to some metal so I love your posts! I will try! Thanks, I'm glad you find them useful! I can't take my eyes of that Ram Skull Ring. It is definitely a very unusual ring. I don't know if I love it or hate but it really leaves an impression behind. I am usually drawn to very classical diamond rings. But, whenever my wild side comes out I feel like wearing something unusual and loud asaccessory. Your ring might just be the solution. Its so unusual but I love it! 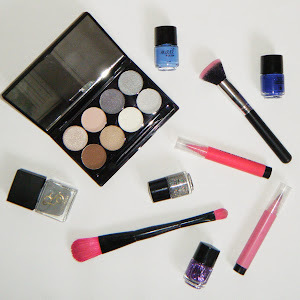 Go for something that isn't your usual - you may love it!